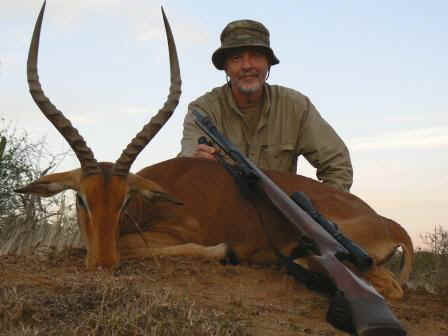 High power airguns suitable for hunting. .58 cal. (.575) pistols & other air guns available. See Currently Available page. Click on the pictures to read the story of the 2000 lb. bison and the black bear and a 330 lb. 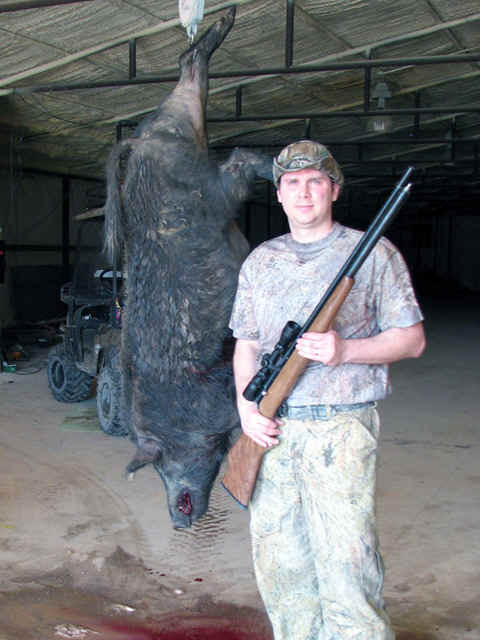 boar taken with a Quackenbush .458 cal. air rifle. Each picture links to a different story. 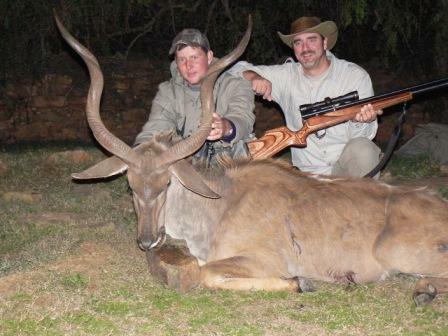 Airgun hunting in Africa. For a description of the hunt just click on the pictures. Each picture links to a different story. 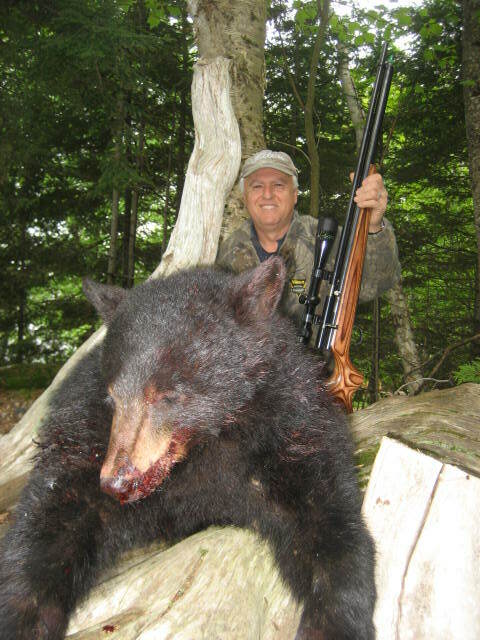 CLICK HEREfor NEW hunting pictures! 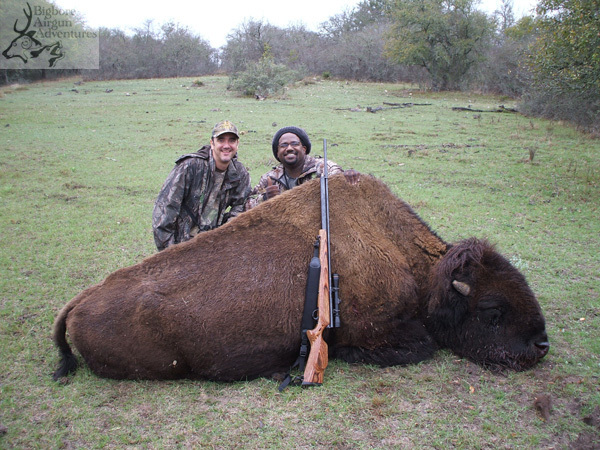 Long Range airgun shoot, Dec. 13, near Dallas, TX. Click on the links (blue works below) to pictures & stories of the event. I don't take deposits, and I don't take money until I have a gun to deliver. 9:00 am. to 6:00 p.m., Central time zone. NO SUNDAY CALLS! The most gun for the money. You're not paying for hype, mystique, or superfluous construction. I don't sell tasteless, useless or ridiculous airguns. There's no place here for aesthetically dysfunctional and mechanically dyslexic airguns. Originated in 1996, the Outlaw series guns are not experiments, they're well tried and proven in the field for going on 20 years now. They are not a copy of any other airgun. Features: a long life valve, stainless steel valve seat, hardened & tempered valve stem & 'O' ring sealed valve guide. No plastic or soft metals used where steel is best: steel trigger guards, steel barrel stays, steel action parts & steel breech. These rifles are hotsalt bath blued, no streaky cold blue. And unlike other air gun makers, every gun that was paid for has been delivered.